Tuna, classified as a fatty fish, includes several different species, with the most widely known being the albacore tuna. Whether you eat fresh tuna steaks or tuna in a can available as either albacore or light, eating tuna contributes to a healthy diet. Despite the fact that tuna, along with other marine life, contains mercury, consumed in moderation tuna provides protein, vitamins, minerals and omega-3 fatty acids with very little saturated fat. 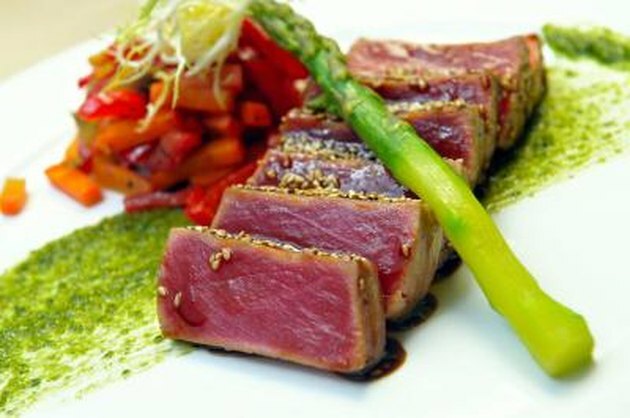 Tuna serves as an excellent source of protein. The protein in tuna is a complete protein, meaning it contains all the essential amino acids the human body needs. Every 100 grams of tuna contains between 23 to 27 grams of protein, depending on whether the tuna is fresh or canned. Ten to 35 percent of your total calories should come from protein sources, so eating tuna contributes to a healthy diet. The human body needs fat to provide long-lasting energy, make hormones, support the brain and nervous system and carry vitamins. Four main types of dietary fat exist: monounsaturated, polyunsaturated, saturated and trans. Saturated and trans fats contribute to high cholesterol, which increases the risk for heart disease. Unsaturated fats, however, help to control blood pressure and cholesterol levels. Tuna provides polyunsaturated fats with very little saturated fat, making it a healthy part of your diet. Omega-3 fatty acids are essential fatty acids that promote healthy growth and development. Omega-3 fatty acids, which must be ingested in foods, reduce inflammation, enhance cognitive and behavioral brain functions and lower the risk of chronic diseases such as heart disease, according to the University of Maryland Medical Center. The American Heart Association therefore recommends eating two 3.5-oz. servings of fatty fish such as albacore tuna per week. Tuna contains several of the essential vitamins and minerals. It serves as a significant source of niacin, also known as vitamin B3. Niacin helps the body process and convert foods into energy. Tuna also contains vitamin A, which supports healthy teeth, skin and bones. Tuna contributes to the daily intake of both potassium, needed to support nerve signaling, and phosphorus, which helps build strong bones and teeth. Mercury, a heavy metal element, can cause brain or kidney damage as well as damage to a developing fetus. Mercury contaminates the air through industrial pollution. The mercury then accumulates in rivers and streams. Microscopic organisms in the water and soil convert mercury to methylmercury. As fish and shellfish eat, the methylmercury accumulates in them. Some fish contain higher levels of mercury than others. Albacore tuna contains more mercury than canned light tuna. The Food and Drug Administration advises it is safe to eat up to 12 oz. of canned light tuna per week but to restrict the consumption of albacore tuna to 6 oz. per week.